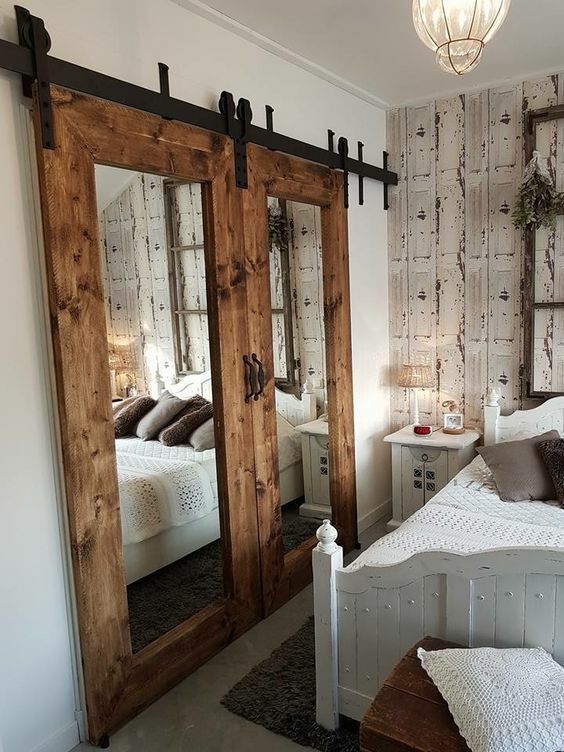 We have already discussed barn doors for bedrooms and barn door closet ideas, so today we will go with the rustic finish. 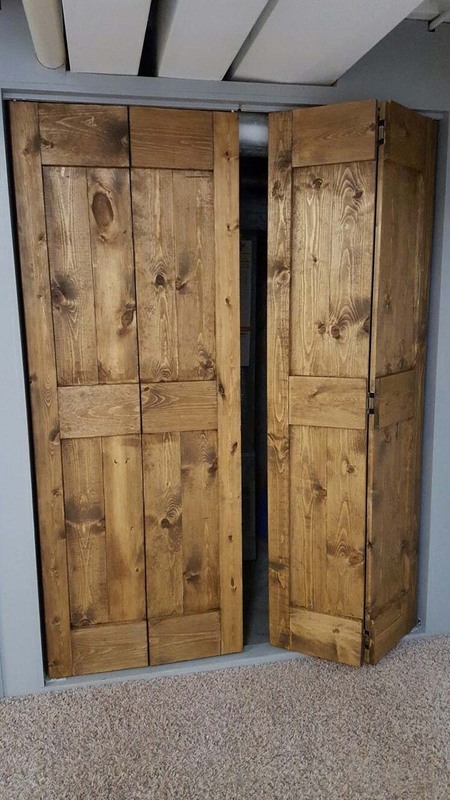 Closet doors have gone a long way since being just a couple of simple wooden board with no intended effect on what a room looks like. They are now an integral part of many homes’ interior. 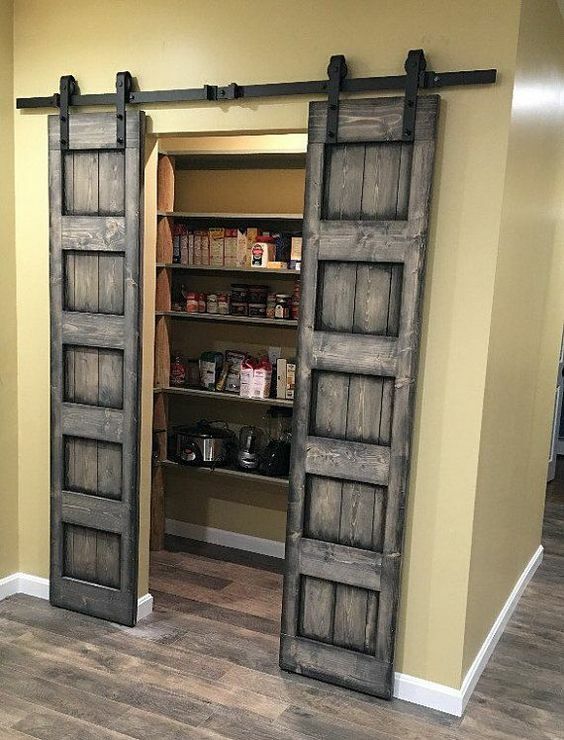 Rustic doors contribute to the style of a room by being a retro accessory and helping create a cozy and laid-back atmosphere. 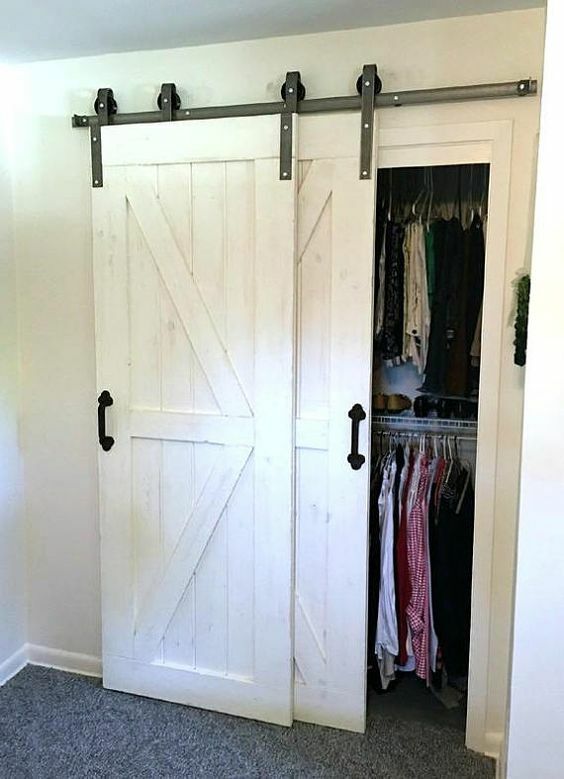 Barn doors are useful, because they save space. They are eye-catching, because they slide to the side, and they are unique in having a railing mechanism, which is a curious thing to observe inside a house. 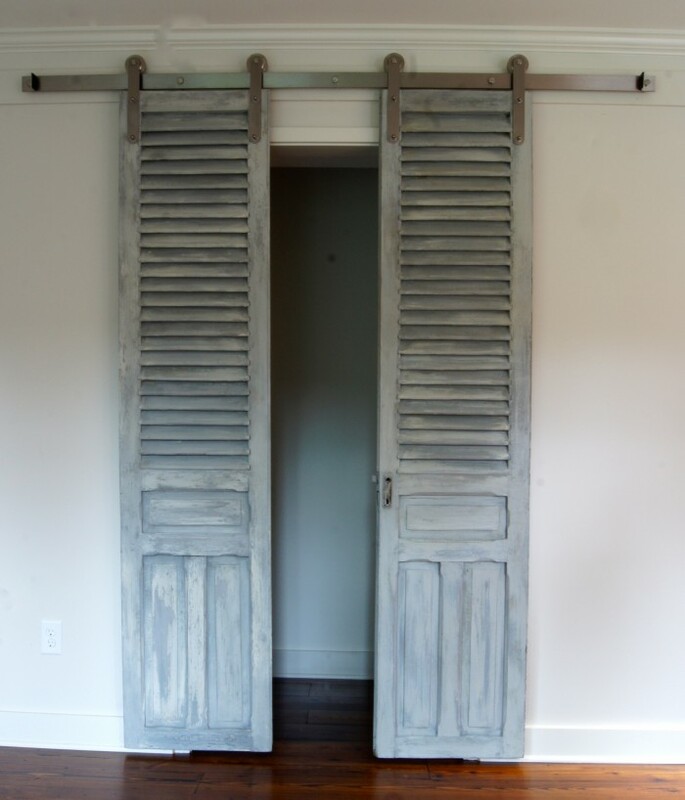 Barn doors don’t necessarily have to do with barns nowadays, though. The feature they share with the actual doors of barns is the easiness of access, which they provide, because they just don’t close by themselves. You can go with a single or double sliding doors. The second option is more common, because that way you need less free space to the side, where you would have to move the door, when opening it. 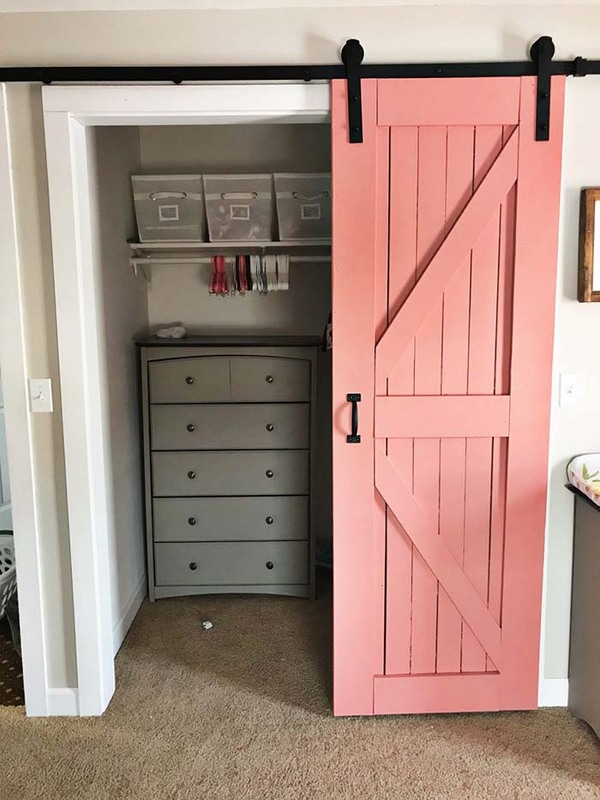 That way you can really keep your space compact, and the closet door itself looks more complete. 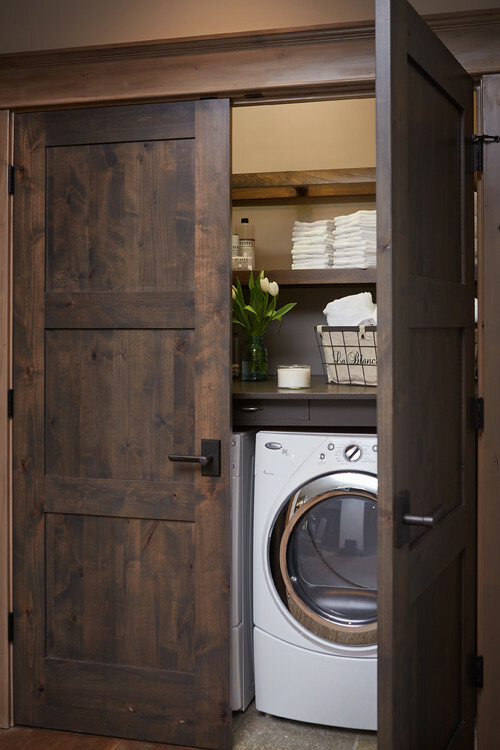 Hiding your laundry room is often a must: you just don’t want your washing machine to take away style points from the interior you put together so carefully. This dark wood door is a welcome addition to your home, because it looks old and rugged, but is still charmingly stylish. 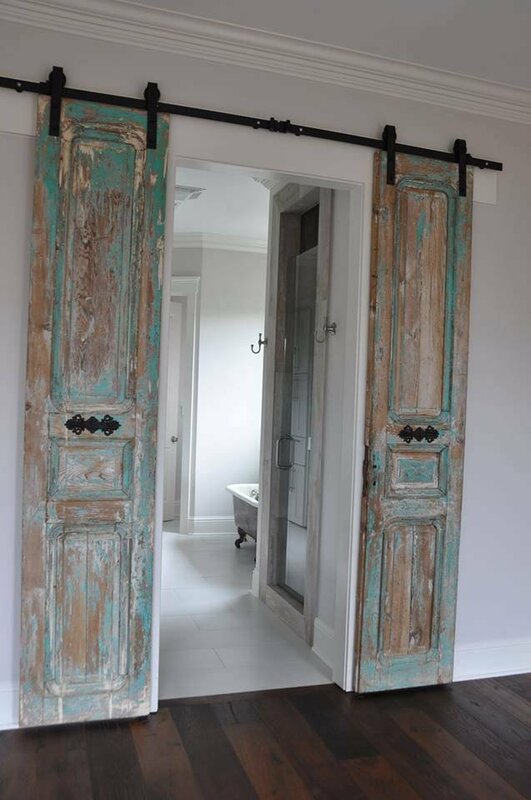 Doors don’t have to be plain in color to fit your other design choices. This coral pink door looks great as an accent, standing out from the white wall. It shakes things up in this household, as it looks vivid and makes visitors guess that there is something extremely entertaining behind it. Speaking about compact doors, something needs to also be said about folding doors. Their mechanism is a bit more complicated, but they are very compact and bring something extra in terms of free-spiritedness and nonchalance, reminding us of a studio apartment. Many people like thinking big. And having a tiny space in front of them doesn’t have to inhibit that. This antique-looking double barn door has so much character it can easily be the centerpiece of a room, even a slick and shiny modern one. This closet door is so antiquated and worn-out it barely shows its original color. It differs from the rest of the interior but also complements it, because, just as weddings, cozy homes need something old (and something blue, even though it is cyan in this case). As we see here, peeled paint doors are definitely a trend. This one matches the floor and has a similar color to the walls, so it is in line with the overall interior. Rustic doors remind us of old country halls, but there is still something very fashionable in the easygoing beauty of their style. 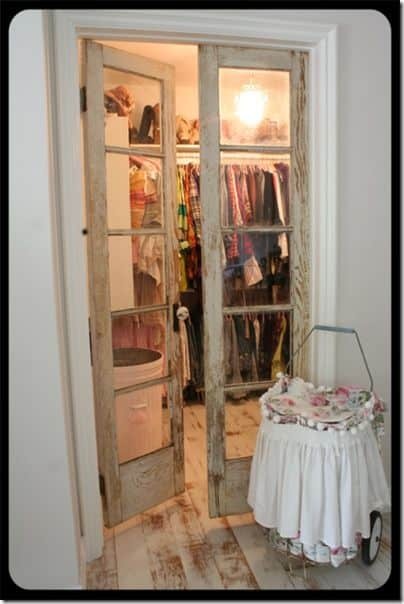 Not last, rustic closet doors are cheap to buy or even DIY. They lack some of the benefits of modern design and most commonly only consist of wood. You can even complete them with a simple curtain instead of glass, and it will look even more authentic, just as it was back in the days. Bedroom closets are a bit more difficult to do than closets in halls, because most people pay more attention to detail when it comes to bedroom interiors. You would want a beautiful item, which stands out, such as this one with its pleasant wooden frame, but you also need it to be practical. Here comes this mirror door, which slides to the side to save space. Sliding, swinging or folding doors, new or antiquated, they all share the purposes of easiness of access, coziness and comfort. 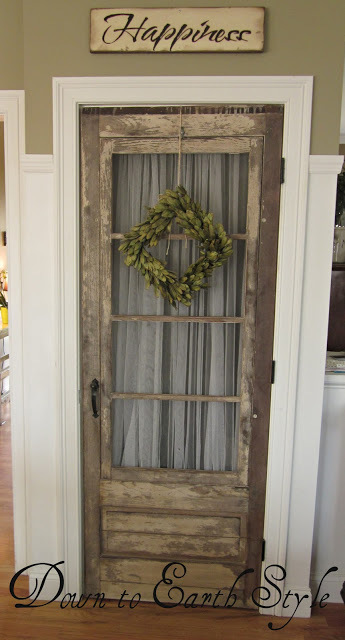 Rustic doors are easy to place and even relatively easy to make, if you have the skills. They can liven up your space with an instant introduction of color and style. If you want to try them out, feel free to pick any of these ten best closet door ideas we shared.